Gentell CMC Fiber Dressing is a carboxymethylcellulose absorptive dressing for wounds with moderate to heavy exudate. Gel-like substance supports the moist healing process and minimizes the risk of leakage and maceration. 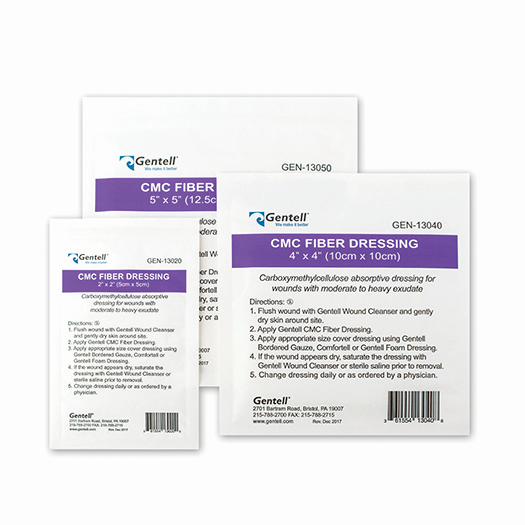 Gentell CMC Fiber Dressing is for use on wounds with moderate to heavy exudate. Flush wound with Gentell Wound Cleanser and gently dry skin around site. Apply Gentell CMC Fiber Dressing. Apply appropriate size cover dressing using Gentell Foam Dressing or Gentell Comfortell. If the wound appears dry, saturate the dressing with Gentell Wound Cleanser or sterile saline prior to removal. Change dressing daily or as ordered by a physician.